If i made a buffer of 64 bytes, then i need to read and use each successive 64 bytes in a sector for 8 times. This is the technique I used to access any sector using low RAM. Now, reading the starting cluter address of a wav file from the root directory (assuming wav files are copied to the root directory), it streams the cluster to the PWM register (ie it loads each byte to PWM just after reading the byte from MMC and thus no need of any buffer memory), then after completing one cluster streaming, it calculates the next cluster address using the previous cluster address by checking it in the linked list called the FAT...This process consumed a small valuable time which gives a 'small pause' to the streaming for a small time interval, which results in a periodic distortion in the audio. This is the main problem of my earlier version of wav player (made 2 months ago). 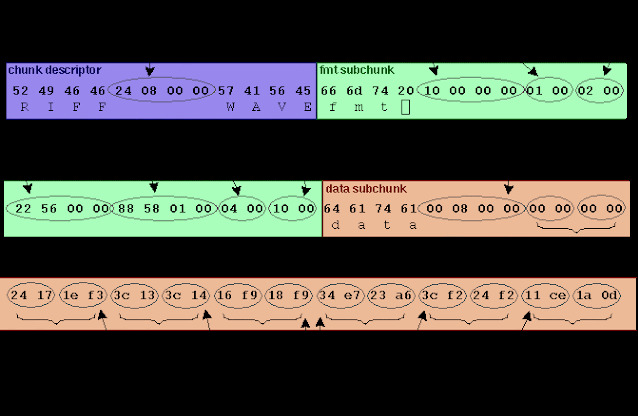 Then after getting the next cluster address, the wav data in the next cluster is streamed to the PWM register, and the process is continued untill a 0xFFFF is read from any successive FAT reading, which denotes the end of file. However, the above mentioned 'periodic noise' is suppressed to an extent in my updated wav player (updated on 06/09/2011). Here, I introduced two buffers of 64-byte each and the steaming is loaded to the 64byte buffers and I used timer interrupt to send the buffered data to the PWM register. Then I observed an improvement in the audio(as in above video). The reason for the improvement is the buffer still streams the data stored in it while the uC is capturing the next cluster address from the FAT. Any way, for high bit rate wav files, still this 64 byte buffer is not enough for the purpose, but I am helpless since RAM memory is limited in PIC16F877A. Also, I am planning to introduce a wireless control, most probably a TV remote control to control the wave player. I prefer a TV remote just because it have many keys and thus I could implement a lot of functions (mute, play, pause, fvd, rev, next song, previous song etc etc all in the same PIC16F877A) by software modification. 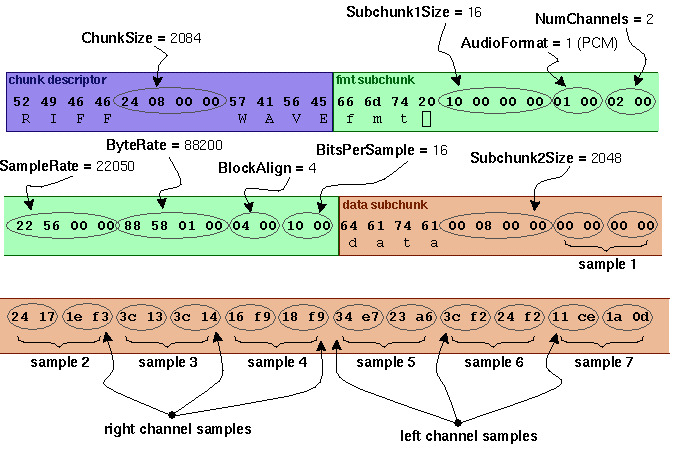 After formatting an MMC using a FAT16 file system, its total memory is divided to various blocks as in below diagram. This information is located in the first sector of every partition. A Cluster is a Group of Sectors on the MMC or Hard Drive that have information in them. A 16K Cluster has 32 Sectors in it (512*32=16384). Each Cluster is given a spot in the FAT Table. When you look at an Entry in the FAT, the number there tells you whether or not that cluster has data in it, and if so, if it is the end of the data or there is another cluster after it. All Data on a Partition starts with Cluster #2 (Right after Root Directory). If the FAT Entry is 0, then there is no data in that cluster. If the FAT Entry is FFFFh, then it is the last entry in the chain. Hello Vinod, this project seems pretty cool. However, I'm having a hard time compiling your source code in MPLab with HI-TECH C. I could test your HEX file directly but the other problem I have is that I don't know how you connected your LCD display. I'm using a standard LCD with an HD44780 chipset (the most standard). I currently have it setup to be used in 4-bit mode (D4-D7). In your schematics above, you don't specify which pin is used for LCD R/*W nor how many data bits are used. Can you please provide me with some more details? It would be greatly appreciated. Thanks. Error  G:\ukyk.c; 7.21 can't open include file "p16f877a.h": No such file or directory. I really don't know what to do . can u send mplab project file me ? HI, I don't have the mplap project files. I missed all those. Actually I did this code before learning proper C, it will be reflected in my code. Anyway, why you are not trying to compile it using mplab hi tech c compiler? i am new to microcontroller based projects. i am looking forward to do a project as Smart Voltage Stabilizer Using PIC16F877A. i wanted to know that how can i burn the program into the pic microcontroller. what are the hardware and software needed for this. The code is very interesting and good for learning FAT16 wav player. The code will compile on HiTechC v9.83 with only a Warning . Older HiTechC will not compile and have errors. However, the code will not work as is due to the fat_init() function seem to have error. Below is the correction I have made and it works on SD card V1 formatted to FAT16 on windows PC. and should work. Hope this helps. hi vinod.s i try to make simple mp3 ,now i can access sd card and reads sample byte by byte but how can out this sample using pwm ( pwm freq_init,duty cycle)!!! 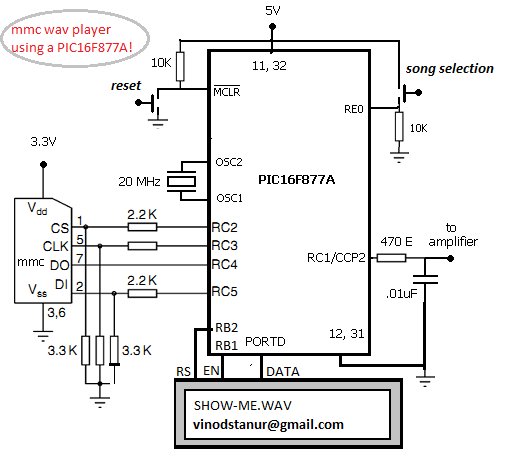 Hi Vinod, i have a question about the code, can i have the timer2 of the pic16f887a running with interrup when the song is playing to make a pair of leds go on and off during the play of the wav file? is the pic16f877a sorry a typo.